and fluently with the ac1200 dual band wireless USB wifi adapter. networks", select the network signal and connect. you have any trouble when using,then we will help you out. 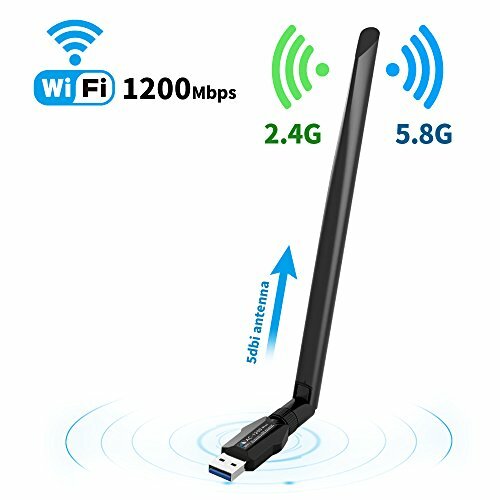 Awesome Transmission Speed:AC1200Mbps wiress USB 3.0 wifi adapter has the maximum speed up to 5.8GHz 867Mbps or 2.4GHz 300Mbps,which make you enjoy a powerful networking experience for surfing, chatting, sharing, or playing online with no pauses ! Hot spot:In AP mode, it can help to create wifi signal for the mobile devices ,such as laptop,iPad,mobile phone ,when your computer is under wired Internet connection. Powerful antenna : Come with an external 5dBi antenna that offer stronger signal penetration strength and wider wireless coverage. It will stay good connection when signals are very weak.Even though you live in a big manor or villa , you are not afraid of no signal! Wi-Fi Protected:The wifi adapter has WPS (Wi-Fi Protected Setup),which would protect your network from being stealing by others. 1200Mbps Wi-Fi adapter support all WLAN routers: WPA/WPA2/WEP, it also support all brand wireless routers.